MEXICO CITY, MEXICO (April 25, 2018): Rey Vargas (31-0, 22 KOs), the undefeated world champion of Mexico City, Mexico, discussed his training camp ahead of the third defense of his WBC Super Bantamweight World Title against Azat "Crazy A" Hovhannisyan (14-2, 11 KOs) in the 12-round co-main event to Sadam "World Kid" Ali and Liam "Beefy" Smith for the WBO Junior Middleweight World Championship on Saturday, May 12 at Turning Stone Resort Casino in Verona, N.Y. The doubleheader will be televised live on HBO World Championship Boxing beginning at 10:00 p.m. ET/PT. 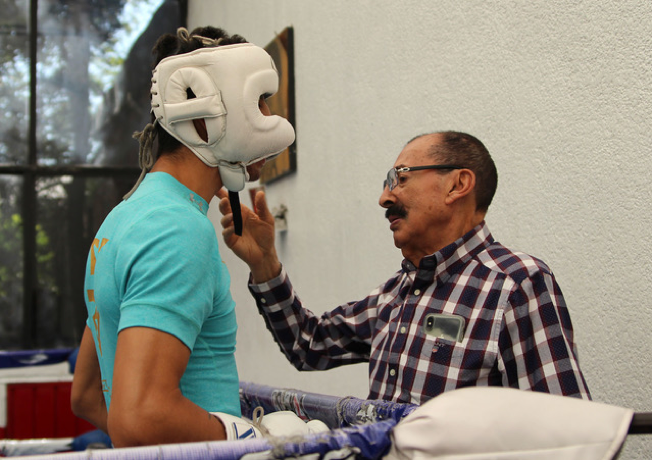 The 27-year-old champion is currently in the strongest stage of sparring at the famed Romanza Gym in Mexico City, Mexico, under the supervision of Hall of Fame Trainer Ignacio "Nacho" Beristaín, along with Oscar Ortiz and Fabian and Emilio Ramirez.When he is not sparring or doing his daily conditioning training, Vargas trains out of his home gym in Otumba, Mexico, working offensive and defensive strategies according to the fight plan in mind. "Like always, we're working on being better for the next fight. We're also working on power and movement, but also on technique and strategy. Nevertheless, everything will be determined in the ring. He can study me all he wants. He could have the better corner, or I could have the better corner. At the end of the day, it will just be me and him, so the one who has prepared the best and has the better strategy will win." "We are just days away from this great fight against a great fighter [Hovhannisyan] who knows how to brawl and move about the ring. He can fight from both stances, so he's not just any kind of fighter. We have to really take into account of who is stepping into the ring with us." "I know that Hovhannisyan has some experience fighting against Mexicans, but not all of us are the same. I know how to box and brawl. It's going to be an interesting fight because he's a brawler who knows how to move when he decides to. We also can't take away the fact that he has a lot of power. It's interesting that we have fought a similar opponent [Ronny Rios]. He knocked him out in six rounds, while I defeated him by unanimous decision. Because of that there may be some doubts, but I'll make things clear May 12." "This fight is my first priority, and I hope to walk out of this fight well and with my hand raised in victory. I want the people to be happy from a great performance. But of course, I'm also thinking about possible unification fights in the future. I would love to unify titles with the current IBF champion Ryosuke Iwase, an opponent who really has caught my attention because he earned his title by knockout in foreign territory." Ali vs. Smith is a 12-round fight for the WBO Junior Middleweight World Championship presented by Golden Boy Promotions in association with Frank Warren. Vargas vs. Hovhannisyan is a 12-round battle for the WBC Super Bantamweight World Title presented by Golden Boy Promotions in association with Promociones del Pueblo. The event is sponsored by Tecate, "THE OFFICIAL BEER OF BOXING" and Casa Mexico Tequila. The event takes place Saturday, May 12 at Turning Stone Resort Casino in Verona, New York. Doors open at 5:00 p.m. ET, and the first fight begins at 6:30 p.m. ET. The doubleheader will be televised live on HBO World Championship Boxing beginning at 10:00 p.m. ET/PT. Host of the May 12 event, Turning Stone Resort Casino is a Forbes Four-Star Award-winning destination resort, which continues to distinguish itself as a premier venue for fight-of-the-year level boxing. The May event will mark Turning Stone's 25th nationally-televised boxing event, cementing the resort as a leading destination for nationally-televised combat sports. Turning Stone features world-class amenities including four hotels, more than 20 signature restaurants and dining options, two spas, an all-new 125,000 square foot Las Vegas style gaming floor, a cabaret-style Showroom, a 5,000-seat arena, five golf courses, several bars, cocktail lounges and nightlife venues with live entertainment every weekend. For more information visit www.goldenboypromotions.com, www.hbo.com/boxing and www.turningstone.com. Follow on Twitter at @GoldenBoyBoxing, @HBOboxing @TurningStone. Become a fan on Facebook at www.facebook.com/GoldenBoyBoxing, www.facebook.com/hboboxing and www.facebook.com/TurningStoneResort. Visit us on Instagram at @GoldenBoyBoxing and @TurningStone. Follow the conversation using #AliSmith.